It has been fourteen years since the Clone Wars ended and the Empire took hold of the galaxy. No one has seen nor heard from the Jedi since then. These once prominent and plentiful peacekeepers have passed into the stuff of legends and folk lore. As the series opens, the Empire is beginning to tighten its grip even further on the star systems under their control. The Imperial Officers are abusing the power given them by using bullying tactics and receiving bribes. The increasing oppression is synonymous with the Empire. They are constantly on the hunt for that one spark that will light the fires of rebellion. Rocketing onto the scene is the Ghost and her crew. They are an eclectic group of beings gathered together on the moderately sized starship. 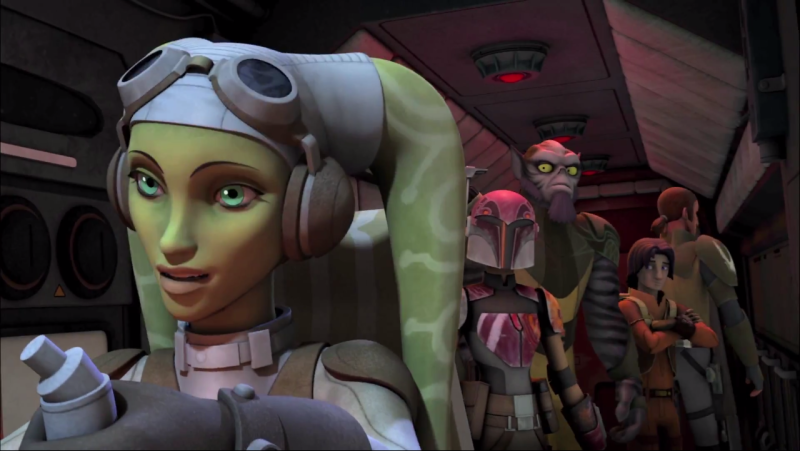 The ship is owned and piloted by a female Twi’lek named Hera Syndulla. She is, or should be the leader, having the initiative to gather the crew and having the contacts to line up odd jobs to keep money in their pockets. Though she retains authority on the ship she defers many of the decisions to Kanan. Kanan Jarrus is a bit of a loner and a Jedi running from his past. In Hera, he has found an anchor to his tumultuous life; a friendship to build on. The other crew members are: Zeb, Sabine, and a grumpy astromech droid named Chopper. Sabine is a young, Mandalorian artist. Her beliefs in the Empire were shattered in the Imperial Academy. Zeb is a large, furry Lasat rarely seen in that galaxy because he is one of the last of his race. They were one of the first races to be decimated to near extinction by the Empire for uprisings and rebellion. A new member joins the crew of the Ghost in the first episode. He is Ezra Bridger, a young teen who is basically a minor thief, stealing what he can just to survive on his own. In the first few scenes where he is introduced, it was like seeing Disney’s Aladdin transported into a science fiction village. The town, located on a planet named Lothal, was small with open air markets complete with awnings. Just as the Imperials began chasing Ezra and the other group led by Kanan, it would not be the least bit shocking had they broken out into the song, “One Jump Ahead.” That was Aladdin’s song about stealing to eat. In fact, Ezra and Aladdin look very similar. Since these properties are part of Disney, it is not surprising. Not that it is a bad thing, in some ways it is good. Taking a familiar character or one with similar traits, and plopping them into a different, or unfamiliar setting allows the audience to quickly assess the character and associate with his or her predicament. Essentially, it gives the audience an anchor to hold on to. Interestingly enough, one of the trailers in the special features is for the Diamond Edition of Aladdin. It would have been nice to have begun the series with an existing character from either one of the movies, or the Clone Wars series. One of the characters could have been Bail Organa, or Mon Mothma. Leia Organa could have served as a main character, since she is a Skywalker. It would have been neat to see a fifteen-year-old Leia becoming a member of the Imperial Senate and joining the fledgling Rebel Alliance. It is true George Lucas is not part of the production, but he has said once that Star Wars, at least the movies, was primarily about the Skywalker family. It makes sense if it is to be called a saga. Who knows, Leia may still make an appearance in a later season. A few of the characters introduced here are interesting enough to keep one’s attention though the character of Ezra seemed a bit flat at first, but as the season rolled out he gained some depth. Kanan discovers Ezra is sensitive in the Force by using a holocron. A device only Force users can open. There is no midichlorian test or mention of them for good or ill. It makes sense since much of that knowledge and technology has probably been lost or destroyed by this time. Upon this discovery, Kanan decides to take Ezra as his Padawan and teach him the ways of the Force. Given that it is only the initial season, there are many tales to be told in which each of the character’s pasts can be explored and personalities be developed. Ezra’s character will definitely be fleshed out as the seasons progress. It was like that with Ashoka Tano in The Clone Wars. She was a pretty standard and bland character when first introduced, but as the series rolled into the fourth season, she became an interesting being and one that would be missed. The relationship between Kanan and Hera was intriguing. They appear to have a close and long standing friendship by the way they act around each other. It will be interesting to see just how close they become, especially since Jedi are not supposed to love. Then again, the rules have changed now that the Jedi Order has fallen. The series is basically a sequel to the outstanding Star Wars: The Clone Wars and it is produced by the same show runners as that series. It has the same look and feel, namely the excellent CGI animation. The character design has not changed much from that series. The lines are softer with more curvature, rather than the sharp angular look in The Clone Wars. The color palate is a bit brighter than The Clone Wars contrasting the dark times that the series takes place in. This series launched on a bit of a down note as it didn’t feel like Star Wars at first. The Clone Wars kicked off with an episode featuring Yoda and some clone troopers and even had Count Dooku in a cameo. It continued to feature characters from the movies whether it was a major character like Obi-wan Kenobi, or a minor one like the Jedi, Shak-ti. 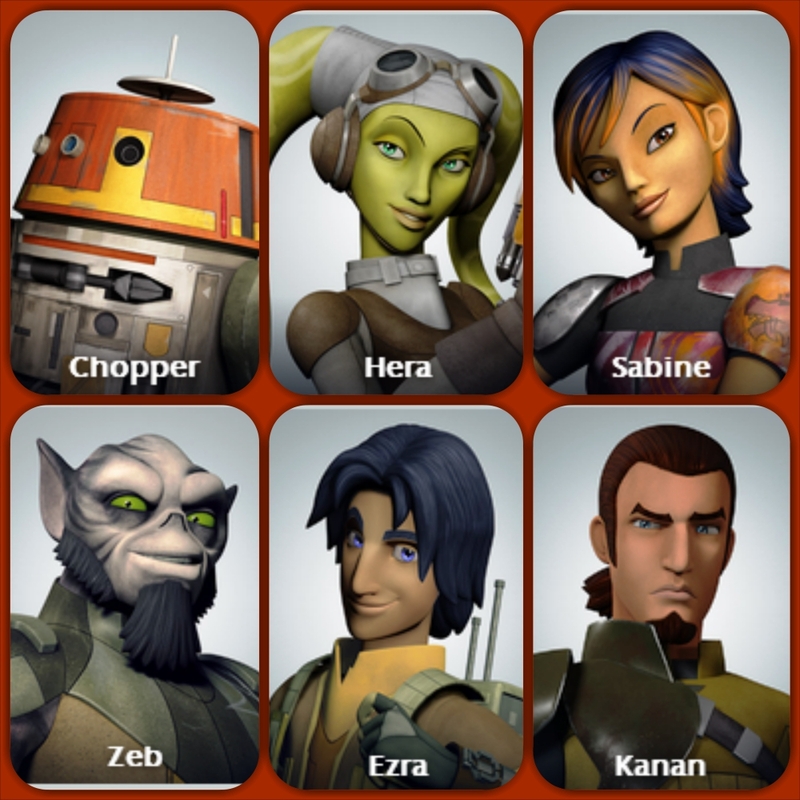 Rebels felt like a fan fiction series where all new characters were created, placed in a new setting and just set about in adventures, occasionally encountering a familiar character or thing for a brief time. About two thirds of the way through the series, the trend changed for the better. It was when Governor Wilhuff Tarkin strode down the boarding ramp of the Imperial shuttle with the Imperial March thumping in the background. It was in that moment that when Rebels finally began to feel the way Star Wars should. That story arc brought in more familiar characters which enhanced the nostalgia that had been gradually growing over the length of the series. By doing this, the show begins to slowly tie into the events of Star Wars: Episode IV: A New Hope. The surprise, fan-favorite character revealed at the end of the final episode cemented the feeling and guaranteed more exciting adventures to come and a pivotal part in the second season and beyond. Each episode has a nice amount of action while keeping it suitable for younger audiences. Even though there is lot of action, each episode finds some time to spend on character development. In an episode where Hera and Sabine become stranded on a planetoid when the Phantom runs out of fuel, they learn to rely on each other and begin to develop a sense of trust for the other. It is a fairly standard plot and the dialogue is a bit unique if forced at times, but the point is clear and it works for the series. As always the Blu-Ray offers 1080p resolution picture and 7.1 surround sound. It looks and sounds as beautiful as anything Disney, and more specifically Lucasfilm has produced. The extras stowed away in this package are plentiful and help extend the voyage. The four short animations used as promotional material are featured here. Also in the special features section are short behind the scenes vignettes on each of the episodes. In addition, there is a Season 1 recap hosted by Kanan Jarrus and a look-a-head special on Season 2 including an extended trailer. Over the summer, Season 2 had begun with a one-hour special featuring the notorious Sith Lord, Darth Vader. However, the journey was cut short as the viewers were left high and dry waiting almost three months for the next episode to air in October. By the looks of it, Season 2 will ramp up with even more excitement from the galaxy far, far away by expanding the episode count to nearly double the first, bringing in more familiar characters and introducing new ones such as more Inquisitors. With all that, Season 2 will be even better than the first. Season 1 of Star Wars: Rebels is a good beginning to a very promising series. It is a bit short with only 15 action-packed episodes, but the extras included in this package make up for it. It is highly recommended for fans of the Star Wars series, fans of animation, or just anyone looking for good entertainment. If you find it slow in the beginning, just hang in there. It will get better!